Santander passenger and car ferry ticket prices, timetables, ticket reservations and information for ferries sailing from Santander to Plymouth and Portsmouth. Compare all available Santander ferry ticket prices in real time and book the cheapest available Santander car and passenger ferry tickets sailing to and from Santander, Plymouth and Portsmouth with Brittany Ferry Line ferries online with instant confirmation. Book Santander Ferry Tickets with Brittany Ferries and LD Lines for ferries sailing from Santander to Plymouth and Portsmouth online in advance to enjoy the cheapest available ferry ticket price. The price you see is the price you pay. There are no hidden extras or surprises such as added fuel surcharges or booking fees and we do not charge you anything extra for paying with a Visa Electron card. The price we quote you for your selected Santander passenger or car ferry ticket, onboard accommodation and vehicle type is all you will pay, and that's a promise. To obtain a Santander ferry ticket price and book your ferry ticket securely online please use the real time ferry booking form on the left. You are also able to add a hotel at your destination, or anywhere else, to your ferry ticket when completing your ferry ticket reservation. Santander is the regional capital of Cantabria on the northern coast of Spain. It's both a bustling Atlantic port and a fashionable seaside resort, mainly for Spanish tourists. Santander is a city in which the mixture of its various vocations, seafaring, commercial and tourism traditions, remains patent. The city's origin is related to the Portus Victoriae founded by the Romans. However, the capital's urban development was not to come about until the XI c. when the town began to grow around the San Emeterio abbey. Britanny Ferries operates two sailings a week from the UK to Santander from mid-March to October, on Wednesdays from Portsmouth and on Sundays from Plymouth, average sailing time hours operated by the modern MV Pont Aven. From November until around December 20th and from Mid-February until March only the Plymouth - Santander service is operated with MS Bretagne journey time 24 hrs. There is no service from around December 20th until mid-February. LD lines operate 2 crossings per week in each direction on the Poole - Santander route. Sailing on LD lines Poole - Santander route, the Norman Asturias has a capacity for 518 passengers, 120 freight vehicles and 195 cars. There are comfortable cabins for a restful night’s sleep and a superb range of facilities to enjoy. Onboard you’ll find a bar, restaurant, shop and comfortable lounges. Santander has many sights to see and places of interest to visit by day. It's also the perfect gateway for exploring the rest of Cantabria which offers a stunningly beautiful array of nature reserves, beaches, medieval villages, mountains and marshes. There are some beautiful beaches within easy reach of the city centre but Santander's maritime climate means it will never be top of the sun seeking package holidaymaker's list. Summers are moderate, winters are mild and grey skies and rain can be expected at any time of the year. But city lovers interested in history, architecture, culture or simply the discovery of what lies beyond the harbour of one of Spain's major ports will not be disappointed in Santander. The best way to experience Santander is on foot. Though the city is elongated in shaped is it still possible to walk from one end to the other, at least if feeling energetic. The central areas, especially the touristic parts of the city, is a relatively concentrated zone & the use of public transport should not be necessary. The land around Santander offers great diversity (on the coast & with mountains to it's rear) which has worked its way into the local cuisine. Expect a multitude of meat & fish dishes here, including fresh Salmon & Trout caught from the rivers surrounding the city. The region of Cantabria is famed throughout Spain for the quality & creaminess of it's milk, with milk based desserts & pastries widely available. Santander offers a good selection of all kinds of retail outlets. These include fashionable boutiques, high street shops, departments stores, markets, & craft shops. During the summer months (June-September) the climate in Santander is warm, with daily highs easily reaching 30°C. It's winters are also relatively mild considering its northern location on the peninsular, with averages at around 10°C. However the region is well known for its high rainfall (in Spanish terms at least), especially outside of the summer season. Best Price Guarantee - We always offer you our lowest available Brittany Ferry Line passenger and car ferries ticket price to and from Santander. There are no hidden extras or surprises such as added fuel surcharges or booking fees and we also we do not charge you anything extra for paying with a Visa Electron card. The price we quote for your selected Santander ferry ticket, onboard accommodation and vehicle type is all you will pay, and that's a promise! 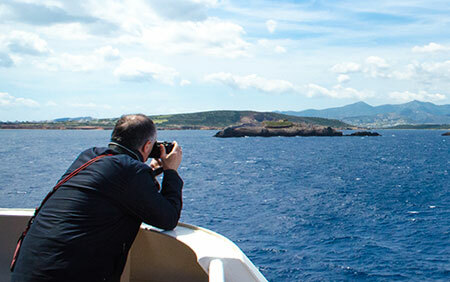 In the unlikely event you find the same all inclusive Santander ferry ticket cheaper in the brochure of any other tour operator we promise that we will do our best to beat that price or offer you the choice of requesting a refund. To book Santander car and passenger ferry tickets please click here. At ferryto.co.uk you are able to obtain live Santander ferry ticket prices, check availability and book car and passenger ferry tickets to and from Santander at our lowest available ticket price. Ferryto.co.uk is part of the world's largest online ferry ticket distribution network providing the ability to book over 80 major European ferry operators including to Santander and to over 1,200 other ferry routes throughout the UK, France, Spain, Ireland, Holland, Eastern Europe, the Mediterranean, the Baltic and North Africa.